Associate Lecturer Hermione Ruck Keene has put together this video to give an overview of our MA Education: Creative Arts programme. Executive Director Karen Wells and ARTS North Carolina Board members bring knowledge, skills, and inside information on how to navigate local and state government resources. Several years ago, a few HGSE Arts in Education program alumni, lamenting the separation from classmates and other like minded arts educators, initiated an alumni-networking group called Continuing the Conversation (CtC). It is worth noting that all of the associate degrees offered by this Baltimore culinary arts school are designed based on that aim. 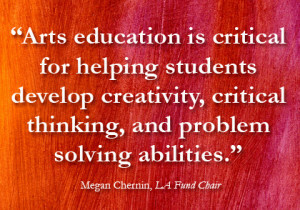 The Arts and Education Council’s crowdfunding platform is designed to connect donors with arts and arts education projects within the Greater St. Louis area. The arts not only help strengthen learning in other subject areas, they also help reach students who might be struggling in school or with social confidence.